Insurers spend 60% of premiums on preventable chronic conditions such as obesity and diabetes. Conditions caused by diet, exercise and other manageable lifestyle patterns. With ageing members and rapidly increasing incidence of chronic conditions, insurers are under growing pressure to attract & retain high-value healthy members to cover the cost of the sick members, and improve the health of those at-risk. Digital health can help with these challenges providing radically cheap, massively scalable, highly effective preventative health programs for a fraction of the cost of traditional health programs. The global life and health insurance market is one of the largest industries in the world with total premiums of $4 trillion USD in 2015, ~720 million members, and over 44,000 health & life insurance providers across the planet. An estimated 618 million people (10% of the population) is covered by private health insurance (PHI) alone and the number is projected to grow to 920 million by 2020. But health and life insurance providers are carrying an increasingly heavy burden. The chronic disease epidemic is putting mounting financial pressure on healthcare and insurance providers, with healthcare costs growing worldwide — just within Asia healthcare costs will increase by 52% to $2.6 trillion by 2020. Over 70% of these costs will come from chronic conditions, and insurers will pay for 30% of these. Source: US Centre for Chronic Disease Control & Prevention, 2011. We think a compelling opportunity for digital health is brewing. Chronic conditions are rapidly increasing. Biosensors in wearables, phones and watches will soon be ubiquitous. Digital health technology is maturing and the insurance market is transforming, driven by the doubling of Asian premiums from $500 billion to $1 trillion by 2020. With increasingly unprofitable members insurers are under pressure to attract healthy young members and improve existing member health. At the same time the tools to provide scalable digital health programs (e.g. wearables, health apps and AI), are maturing, reducing in cost, becoming ubiquitous and increasing their return on investment. Cultural and generational changes also mean over 50% of people are now open to sharing health data with their insurer for a benefit such as a reduced premium. Under mounting pressure insurers, including Humana, Oscar, HBF, AIA, AXA and Medibank are increasingly partnering with technology companies to develop innovative insurance products that both attract & reward healthy members, while reducing the costs from high-risk members. Several converging trends are creating a mounting financial problem for Asian insurers, compelling them to use innovative digital health solutions to attract, encourage and improve member health. As Asian economies develop health & life insurance coverage in the region will increase, with Asian premiums doubling from $500 billion to $1 trillion by 2020. Additionally, governments are legislating to incentivise greater insurance coverage. We’re all getting fatter. Obesity Rates: percentage of population by selected country. Source: OECD. Preventable chronic diseases like diabetes and obesity are rapidly increasing. Chronic disease will account for 57% of the global disease burden by 2020, of which 60% will be in developing countries (China already has 92M diabetics). By 2020 WHO estimates 1.6B people will be overweight, 300M diabetic, and 75% of deaths globally will be from chronic disease. 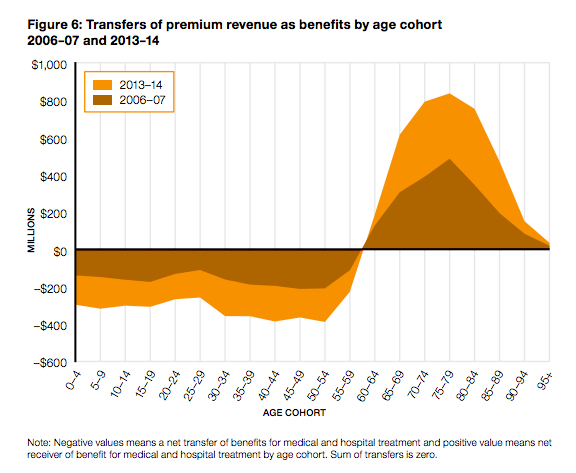 Source: APRA, Operations of the Private Health Insurers, Annual Report 2013–14. Ageing populations mean many countries in Asia and Europe face a situation where the average age is approaching 50 and the largest population cohort is over 65. As people age they increasingly call on healthcare services, particularly after the age of 50. Greater numbers of higher claiming, less profitable members puts increased pressure on insurers to attract younger healthier members to cover these costs. Ageing and high-risk members seek more insurance, use more healthcare and generate higher costs than their low-risk peers. [ix],[x],[xi],[xii],[xiii] Insurers are increasingly covering a greater portion of healthcare costs, generally paying 30% of all healthcare expenditure. PHI alone spend over $3.2 trillion USD a year worldwide on healthcare. This mounting burden puts pressure on insurers to maintain a healthy member population. If ageing and increasingly sick member populations aren’t tough enough, insurers also suffer from adverse selection, that is those members with higher risk-profiles tend to purchase more insurance. With most information only captured at critical health events insurers are unable to identify risk early, intervene prior to costly critical health events or price premiums accurately. Estimates for the wearable market in 2018 range from $5B to $30B. Either way the number of people continuously tracking their health data is set to explode over the next few years. The mounting burden of chronic disease, greater adoption of biosensors and the growing maturity of preventative digital health services, together with the greater willingness of insurers to use digital health technology, conspire to make it the perfect time for health-insurance-tech companies to enter the insurance market. Smartphone users are expected to grow from 2B to 6B in 2020. In the US 30% of people already use a health & fitness app and wearables are becoming increasingly common, with over 12% of Americans having used a wearable. Estimates for wearable & smart-watch shipments are as high as 900M for 2020. Ubiquitous biosensors expand the population that generate health data and provide a unique opportunity for health-tech companies and insurers to use the data to encourage and reward healthy behaviour, identify risk and deliver scalable preventative health programs across entire member populations. An opportunity that never existed previously. With mounting financial pressures on insurers they are searching for scalable ways to address ageing and increasingly sick member populations. Ubiquitous health data and digital health allow insurers to monitor members, identify risky behaviour, and predict & prevent costly health events such as heart attacks before they occur. And its not just developed markets that are adopting digital health. BCG estimates the Digital Health market in China will grow from $3B in 2014 to $110B in 2020. As preventative digital health services mature they increasingly provide a compelling alternative to traditional approaches — delivering strong positive health outcomes for a fraction of the cost of traditional healthcare. Research shows digital health programs achieve cost reductions between 3.5% to 16%; health risk reductions between 5.6 to 22%; diabetes risk reduction of 60%; average weight losses of 5% at 12 months; and Return on Investments due to cost savings up to $4:1. All persuasive reason for insurers to adopt preventative digital health. Source: Rock Health report, Digital Health Consumer Adoption: 2015. With more health data and increasingly useful health tools on their phones people are increasingly open to sharing health data with their insurer for a benefit such as a reduced premium. Rock Health’s recent consumer survey showed 52% of people are open to sharing data in return for a financial incentive. Greater data availability both at the point of purchase and for the duration of a policy assists insurers with risk assessment, adverse selection, pricing, marketing and managing member health. As biosensors & digital health services become cheaper, more accurate, ubiquitous and increasingly effective they open the possibility for insurers to provide innovative products that incentivise healthy lifestyles among members — therefore reducing risks, decreasing costs and increasing profits. Under mounting pressure insurers, including Humana, HBF, AIA, AXA and Medibank, are increasingly partnering with technology companies to develop innovative insurance products that both attract & reward healthy members, while reducing the cost of managing high-risk members. An increasing number of startups are tackling the industry such as full-stack insurers like Oscar Health and Clover, innovative broker models like Zenefits or Knip, and digital health companies like Omada health. The opportunities for startup tech companies to tackle the insurance value chain are huge and exciting, from acquisition and member engagement to predictive and preventative health programs. And, most importantly, not only is it a large market, but more so than any other health related industry insurers profitability is aligned with positive health outcomes. And now more than ever people need radically cheap, massively scalable, highly effective health services. We’re excited to be on this journey, reach out if you want to find out more about what we are doing at Boundlss. [ii] Given ~80% of premiums go to claims, and ~75% of claims are caused by chronic disease we estimate ~60% of premiums are spent on chronic disease. [v] Operations of the Private Health Insurers, Annual Report 2013–14. [vi] Chronic Diseases: The Power to Prevent, The Call to Control: At A Glance 2009. , downloaded January 28, 2011. [ix] Health Management Research Center. The Ultimate 20th Century Cost Benefit Analysis & Report: The University of Michigan; 2000. p. 1–39. [x] Gemignani J. Best practices that boost productivity. Bus Health 1998. [xi] Milliman and Robertson Inc and Control Data Corporation. Health Risks and Behavior: The Impact on Medical Costs. Brookfield, WI: Report by Control Data Corporation; 1987.